RT @budcrawford402: Good morning everyone!!! RT @budcrawford402: I fight so hard because I've been scared since a child. Crawford Victorious by TKO Victory! At the age of 31, Terence is a 10-year pro. A three-division world champion, he is universally considered one of the best in the ring today – “pound for pound” – and considered by many to be the best. He is one of boxing’s brightest rising stars. In addition to his exceptional ability in the ring he has a fierce competitiveness that reminds some observers of a young Roberto Duran. Terence won the WBO lightweight world title on March 1, 2014, and made two successful title defenses over the next eight months. Those three performances earned him the Boxing Writers Association of America’s award for the “2014 Fighter of the Year.” He vacated the title to move up in weight, won the WBO junior welterweight world title in April, 2015, and made two successful title defenses. Terence made his third WBO defense and won the WBC title in a title unification bout in July, 2016, and defended the unified titles two times. He unified all four world titles at 140 pounds in August, 2017. In the four-title era, Terence is one of only three fighters, with Bernard Hopkins and Jermain Taylor, to hold all four unified titles. Terence vacated those titles to again move up in weight and won the WBO welterweight title in June, 2018. 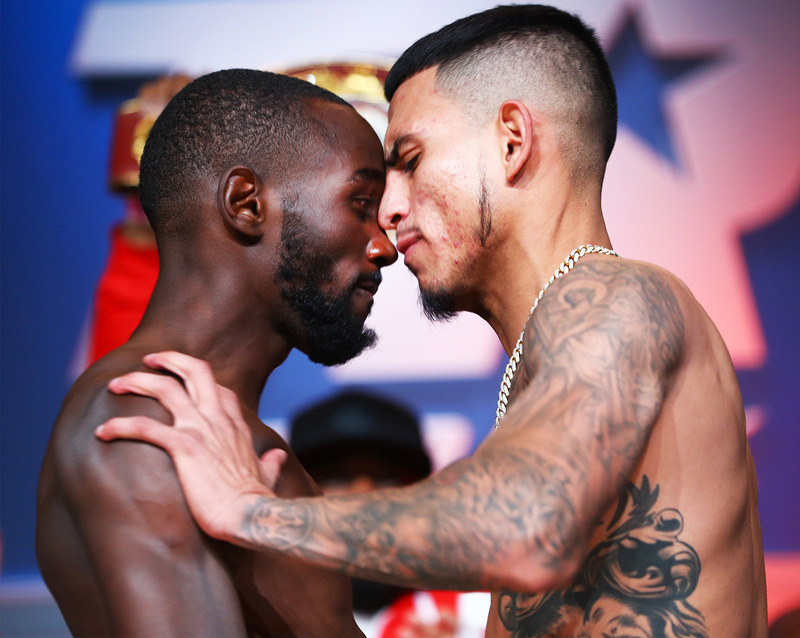 In his last fight on October 13 in Omaha, Terence made the first defense of the WBO welterweight title with a 12th-round TKO win against previously undefeated Jose Benavidez Jr.
ESPN.com’s Dan Rafael reported [excerpts]: Terence Crawford is a bona fide attraction. Not only did his welterweight world title-retaining 12th-round knockout of Jose Benavidez Jr. take place in front of his largest crowd to date, 13,323 at the CHI Health Center in Crawford’s hometown of Omaha, Nebraska, the card drew the largest viewership for any boxing or MMA event on broadcast or cable television so far in 2018. The full telecast averaged 2.245 million viewers and peaked at 2.708 million in the later stages of the main event, according to Nielsen Media Research. The telecast also drew ESPN’s largest boxing audience since the Manny Pacquiao–Jeff Horn card averaged 2.8 million viewers in July 2017 as the network kicked off its long-term deal with Top Rank. Crawford outclassed Benavidez before scoring a violent, 12th-round knockout to retain his 147-pound title for the first time before a raucous crowd … and he gave the hometown fans a show. After dominating virtually the entire fight … Crawford knocked Benavidez down with a thunderous right uppercut with about 45 seconds left in the fight. He battered him until referee Celestino Ruiz stepped in to wave off the fight at 2 minutes, 42 seconds as the crowd went wild. The knockout capped an outstanding performance from Crawford, regarded as one of boxing’s pound-for-pound best fighters in the world. Two-time fighter of the year Crawford began the fight working his jab and going to the body with it before switching to a southpaw stance about halfway through the round, as he often does, and he stayed that way for most of the rest of the fight. Benavidez looked like he wanted to set up a right hand, but he could never find a clean home for it. Crawford landed to the body in the second round and made Benavidez take a step back and shake his head. He did that several times in the fight. Crawford picked up the pace in the third round, repeatedly landing combinations to the head and body and again forcing Benavidez to take a step back. The body shots were key, said Crawford. Benavidez had a strong fourth round, his best of the fight, and landed several clean blows. A strong left hand to the head caught Crawford. But Benavidez fought only in spurts. In the fifth round, for example, he spent a long stretch planted in the middle of the ring as Crawford went after him and landed a chopping right hand to the head before forcing him back as the round came to an end. After Crawford stung Benavidez with a flurry of punches early in the ninth round, a seemingly dejected Benavidez went back to the ropes and motioned for Crawford to come at him. He did and landed some more punches. He continued to land combinations to the head and body, while Benavidez rarely got off more than one punch at a time. With Benavidez fading in the final round, Crawford tagged him with the hellacious uppercut that knocked him down. He surprisingly made it to his feet and continued, but Crawford went right to him and blasted him with a pair of right hands, and Ruiz stopped it as Benavidez was falling to the canvas again. Terence’s six fights in Nebraska since he won the world title – five in Omaha and one in nearby Lincoln – have drawn impressive crowds: 10,943 on June 28, 2014; 11,127 five months later on November 29; 11,020 on October 24, 2015; 11,270 on December 10, 2016; and 12,121 on August 19, 2017. His last fight on October 13, 2018, topped them all with 13,323. In earlier interviews, Terence said, “My strategy is just being me. That’s always our strategy. If I go in there and fight my fight and be me, can’t nobody beat me. “I’m a boxer-puncher, a counterpuncher type. But for me, it just depends on the fight – it just depends on the moment. You’re in there, you’re trying to see what you can do, you get hit with a shot, then you feel like you’ve got to step it up sometimes. You never know if your opponent is going to come out and press the action and make it a fast-paced fight. Terence showed his potential in an impressive amateur career that included wins against Danny Garcia, who went on to win the WBC and WBA super lightweight and WBC welterweight world titles, and three-division champion Mikey Garcia, who currently holds the WBC lightweight world title. Terence also won gold medals at the 2006 Blue & Gold Nationals and 2007 PAL Nationals, and earned a spot as an alternate on the 2008 U.S. Olympic team. AMATEUR, PERSONAL BACKGROUND: Terence said, “I was born in Omaha, Nebraska. I have two sisters. My dad is retired from the Navy, and my mom don’t have a job. My parents are separated. My dad and my grandfather were both boxers – they both were amateurs. My dad fought in the Golden Gloves and stuff, but he was more into wrestling. My grandfather was a good boxer, too, but never turned pro. My uncle – my mom’s brother – was a boxer, and my dad’s brother was a boxer. My cousins, we all started boxing at the same time. I’m just the only one that stuck with it. “I was seven years old when I started boxing – it was just something to do. I didn’t like just being at home, not doing nothing. I liked it – I just liked to fight. When I was a kid, my dad used to have me punch his hands and wrestle with me and throw the football and basketball, but he basically made me pick my own sport. He never pushed anything on me. From the Omaha World-Herald, by Tony Boone [May 5, 2013 – excerpts]: Crawford liked to fight even at a young age. And Carl Washington knew that. The founder of the C.W. Boxing Club was Crawford’s neighbor. Crawford’s grandfather, father and uncle had all trained at Washington’s gym. The 7-year-old Terence didn’t know any of that. And he didn’t know Washington, who lived behind them. “Carl saw me on the streets,” Crawford said. “He knew I was one of those little bad kids that wanted to fight around the corner.” One day, Washington asked him if he wanted to box. By the time Debra Crawford heard her son’s story, Washington was at the front door. It was then Crawford learned of his family’s history with boxing. He was at C.W. soon after. But his fighting didn’t stay in the gym, even though trainer Midge Minor tried to keep it there. Minor had a feeling early on that Crawford had a gift for boxing. But C.W. Boxing’s longtime trainer, now 73, wasn’t sure if his prodigy would make it. Crawford’s father, Terry, was in the Navy. He was rarely around. And when he was, his son said, the elder Crawford wasn’t at the house. His mother mostly raised him and his two sisters alone. Minor became a father figure for Crawford. But in his teenage years, his boxer developed an interest in roaming the streets of north Omaha with friends. Trouble often ensued. Minor came down hard on him. To keep Crawford off the streets, he would bring the teen to his house after school to watch boxing tapes before they would go to the gym. Crawford often tried to hide when Minor showed up to get him. His mom always blew his cover and turned him over. How quickly things can go south was driven home in September 2008, only a few months into Crawford’s pro career. Crawford’s fateful day began with an argument with his mom. Later, he and some friends were thrown out of SeptemberFest, an Omaha Labor Day celebration, by security. Crawford was nearly hit with a nightstick. When he began to protest, a guard sprayed Mace into his eyes. After catching a ride back to north Omaha, Crawford began using an outdoor hose at a friend’s house to rinse his eyes. He was having no success, and his friend’s father wasn’t pleased. Upset, he left to clean up elsewhere. It took an hour, he said, to see clearly. During that hour, he received a phone call about a dice game around the corner. He knew he shouldn’t go. He went anyway. The dice game grew heated. Crawford knew he needed to leave. In the driver’s seat of his car, however, he paused to count his money. At that moment, a bullet crashed through the back window and hit him in the head behind his right ear. With blood dripping down his shoulder and back, Crawford drove to the hospital. It was there that he realized his lifestyle had to change. Crawford was fortunate. The bullet didn’t enter his skull. “It went through the window, hit me and bounced out,” he said. “The only reason, the doctor said, that it didn’t go through was because the window slowed it down. I was blessed. If the shooting was a wake-up call for Crawford, fatherhood was a full-blown alarm. Upon finding out his girlfriend, Alindra, was pregnant, he knew his life had fully changed. The father often credits his son for bringing balance to his life. Minor, and Crawford’s current co-manager Brian McIntyre, had visions of Crawford becoming Omaha’s first Olympic boxer since Carl Vinciquerra in 1936. Their fighter had a bigger goal. 2006 NATIONAL PAL CHAMPIONSHIPS – Oxnard, California, 132 pounds – GOLD MEDALIST: in his first fight on 10-2-06 he won a decision against Miguel Gonzalez of Cleveland, Oh. ; in his second fight on 10-4-06 he stopped James Villa of Omaha, Neb., at 0:04 of the 2nd round; in the quarterfinals on 10-5-06 he won a 22-11 decision against Stan Martyniouk of Antelope, Calif.; in the semifinals on 10-6-06 he won a 7-4 decision against Javier Garcia of Oxnard, Calif.; in the finals on 10-7-06 he won a 13-8 decision against Diego Magdaleno of Las Vegas, Nev…. 2006 BLUE & GOLD NATIONAL CHAMPIONSHIPS – Carson, California, 132 pounds – GOLD MEDALIST: in the quarterfinals on 7-31-06 he stopped Jose Fernandez; in the semifinals on 8-1-06 he won a 5-0 decision against Paul Green of Long Beach, Calif.; in the finals on 8-2-06 he won a 3-2 decision against Danny Garcia of Philadelphia, Penn…. 2006 U.S. NATIONAL UNDER 19 CHAMPIONSHIPS – Kansas City, Missouri, 132 pounds: in his first fight on 8-2-06 he won a 23-5 decision against Jessie Carradine of Cincinnati, Oh. ; in the quarterfinals on 8-3-06 he lost a 15-11 decision against Jerry Belmontes of Corpus Christi, Tex…. 2006 U.S. NATIONAL CHAMPIONSHIPS – Colorado Springs, Colorado, 132 pounds – BRONZE MEDALIST: in his first fight on 3-7-06 he won a 18-7 decision against Mikey Garcia of Oxnard, Calif.; in the quarterfinals on 3-8-06 he won a 17-13 decision against Stan Martyniouk of Antelope, Calif.; in the semifinals on 3-9-06 he lost a 21-20 decision against Danny Garcia of Philadelphia, Penn…. 2007 U.S. PAN AMERICAN GAMES BOX-OFFS – Colorado Springs, Colorado, 132 pounds – GOLD MEDALIST: in the semifinals (his first fight) 1-20-07 he won a 25-15 decision against Luis Ramos of Santa Ana, Calif.; in the finals on 1-21-07 he won a 24-13 decision against Diego Magdaleno of Las Vegas, Nev…. 2005 U.S. NATIONAL CHAMPIONSHIPS – Colorado Springs, Colorado, 125 pounds: in his first fight on 3-16-05 he won a 27-9 decision against Saul Lomas of Fresno, Calif.; in the quarterfinals on 3-17-05 he lost a 22-18 decision against Ray Robinson of Philadelphia, Penn…. 2004 JUNIOR OLYMPICS NATIONAL CHAMPIONSHIPS – Brownsville, Texas, 125 pounds: in his first fight on 6-23-04 he lost a 12-5 decision against Darnell Jiles of Rochester, N.Y…. ESPY “2018 Fighter of the Year"
WON WBO W WORLD TITLE – In his last fight on 6-9-18 in Las Vegas, NV, he won by TKO (9th round) against previously undefeated defending champion Jeff Horn (18-0-1): the bout headlined at the MGM Grand – it drew a crowd of 8,112, and Terence dominated the fight; he consistently out-boxed and out-worked Horn, landed the harder punches, and rocked him repeatedly; Horn was cut over his right eye in the 4th round, and Terence wore him down in the following rounds; Terence scored knockdown with a series of punches when Horn’s glove touched the canvas in the 9th round – he rocked Horn with a series of punches when the action resumed, and the referee stopped the fight at 2:33; after eight rounds, Terence led by shutout scores of 80-72 on all three scorecards. 5TH WBO JW WORLD TITLE DEFENSE, 2ND WBC SL WORLD TITLE DEFENSE – On 5-20-17 in New York, NY, he won by TKO (10th round) against left-handed 2008 Olympic gold medalist Felix Diaz (19-1): the bout headlined in the main arena at Madison Square Garden – it drew a crowd of 8,026, and Terence dominated the fight; Diaz pressed forward and landed a few right hooks in the early rounds, but Terence, fighting entirely in the left-handed stance, consistently out-boxed and out-worked him; Diaz stepped up his pace in the middle rounds, but Terence landed the harder punches and wore him down – he staggered Diaz with a left uppercut in the 8th round, followed by a left hand to body moments later, then rocked Diaz with a left hand in the 9th round; Terence rocked Diaz with a series of punches late in the 10th round, and Diaz’ corner stopped the fight after the round; after 10 rounds, Terence led by scores of 100-90, 100-90, 99-91. 4th WBO JW WORLD TITLE DEFENSE, 1ST WBC SL WORLD TITLE DEFENSE – in his last fight on 12-10-16 in Omaha, NB, he won by TKO (8th round) against John Molina Jr. (29-6): the bout headlined at CenturyLink Center and drew a crowd of 11,270; Terence dominated the fight – he switched to the lefthanded stance midway through the 1st round, stayed there for the rest of the fight, and consistently outboxed and outworked Molina; Molina constantly pressed forward, landed a good right hand in the 1st round and another in the 3rd, but Terence consistently landed the harder punches and steadily wore him down; Terence staggered Molina with a series of punches in the 8th round, backed Molina into a corner, then scored a knockdown with another series of punches that ended with a right hook to the body, and the referee stopped the fight without a count as Molina fell to all-fours at 2:32; after seven rounds, Terence led by shutout scores of 70-63, 70-63, 70-60. 3RD WBO JW WORLD TITLE DEFENSE, WON WBC SL WORLD TITLE – On 7-23-16 in Las Vegas, NV, he won a 12 round unanimous decision in a title unification bout against previously undefeated WBC super lightweight world champion Viktor Postol (28-0): the bout headlined at the MGM Grand and drew a crowd of 7,027; Postol pressed forward, but Terence kept him off-balance with movement, consistently landed the harder punches, and dominated the fight; he switched to the lefthanded stance early in the 1st round and fought that way for the entire fight; the early rounds were close and after four rounds, all three judges scored 38-38; but Terence scored two knockdowns in the 5th round – the first with a right hook that dropped Postol to one knee, the other with a left hand when Postol’s gloves touched the canvas – and dominated the rest of the fight; he consistently outworked Postol and rocked him with a left hand in the 6th round, rocked him with a right hook in the 8th round, then staggered him with a left hand in the 9th round; Postol was penalized one point for punching to the back of the head in the 11th round; scored 118-107, 118-107, 117-108. 2ND WBO JW WORLD TITLE DEFENSE – on 2-27-16 in New York, NY, he won by TKO (5th round) against Hank Lundy (26-5-1): the bout headlined in The Theater at Madison Square Garden and drew a capacity crowd of 5,092 – Lundy gave a good effort, but Terence dominated the fight; he switched to the lefthanded stance in the 1st round and controlled the pace of the fight with a hard scoring jab; Terence won the 1st and 2nd rounds on two scorecards, then swept the 3rd and 4th on all three; he staggered Lundy with a left hand midway through the 5th round, then scored a knockdown with a series of punches moments later – Lundy got up, but Terence staggered him with another series of punches and the referee stopped the fight at 2:09; after four rounds, Terence led by scores of 40-36, 40-36, 38-38.